Like many Korean dishes, this one can be made on its own as a side dish or combined into other dishes. The first time I tried it, it was as part of a very complicated dish we served on Christmas Eve called “Celestial Hot Pot” – this is the only part of it that I’ve done again, and I’ve made it many times for friends. Unfortunately I don’t have great photos of it yet because every time we finish making it we usually sit down to start eating it right away. One of these days I’ll bother to make it ahead of time and get better photos that way. 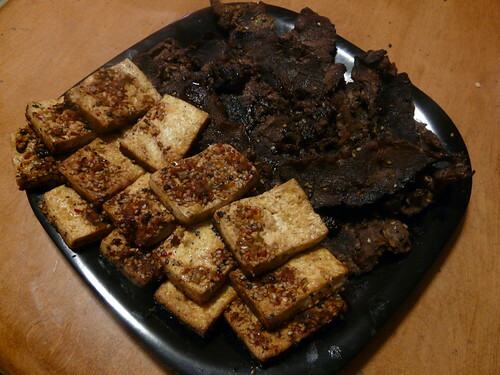 It does take some time to do the frying and the sauce has a lot of ingredients, but it is worth the bother to have people who say they always hate tofu eat some and immediately take seconds! 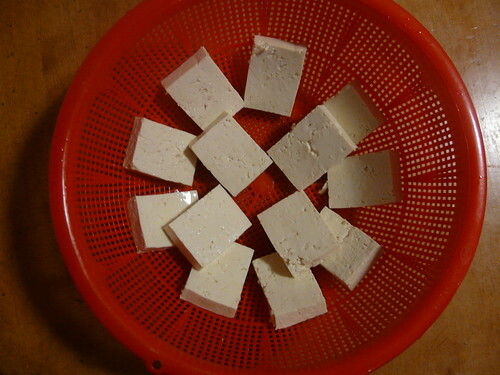 To prepare the tofu, drain off the water and cut into 1/2″x2″x3″ pieces and lay on paper towels to drain or on a colander. Set aside. In a bowl, combine the sauce ingredients and mix well. Set aside. In a non-stick skillet, put in the vegetable oil and heat over medium-high heat until hot but not smoking. Add the tofu and fry 3 min on each side or until edges turn golden – you may need to do it one half at a time to get it done. Remove and drain on paper towels again. Add all of it back to the skillet and pour the sauce over it. Cover and cook for 15 min. or until the bean curd absorbs the sauce and the sauce is reduced and becomes like a syrup. Transfer to a serving plate and garnish with sesame seeds and red pepper threads or flakes. This can also be made ahead and stored in the refrigerator up to 1 week – it’s good on it’s own or slidced and added to noodles or fried rice.